The 1973 Porsche 917/30 Can-Am Spyder sold for $4.4 million at Gooding & Company's $36 million Amelia Island Auction on March 9, setting a double record for a Porsche and a 917 at Auction. Image copyright and courtesy of Gooding & Company. Photo by Pawel Litwinski. “We are extremely pleased with our $36 million auction results, as it underscores the continued strength at the top of the collector car market,” says David Gooding, President and founder. Gooding & Company, the acclaimed auction house celebrated for selling the world’s most significant and valuable collector cars, is thrilled to announce more than $36 million in sales from 70 out of 77 lots sold at its Amelia Island Auction on March 9, more than doubling its results from 2010 and establishing a new auction record for Amelia Island. Led by many extraordinary Porsche racing cars that were part of the Drendel Family Collection, 11 world records were achieved. The top-selling lot of the Amelia Island weekend, the 1973 Porsche 917/30 Can-Am Spyder sold for $4.4 million and is now the most valuable Porsche ever sold at auction in the world. President and founder David Gooding and Auctioneer Charlie Ross entertained guests throughout the day’s many auction highlights which included lively bidding wars, more than ten individual sales over a million dollars and a surprise stage appearance by Derek Bell. The world-renowned race car driver introduced the significant 1984 Porsche 962, which he piloted in one of the most competitive races in Daytona history. In addition to the 17 exceptional Drendel Family Collection Porsches that sold for more than $17.7 million, Gooding & Company auctioned off a wide variety of unique collector cars, such as the 1955 Porsche 550/1500 RS Spyder that sold for $3.685 million, the 1951 Ferrari 212 Inter Coupe that sold for $1.375 million and the 1948 Tucker 48 that sold for $1.32 million. The 1973 Porsche 917/30 Can-Am Spyder (lot 57) at $4,400,000, a double world auction record for a Porsche and a 917. The 1955 Porsche 550/1500 RS Spyder (lot 15) at $3,685,000, a world auction record for a Porsche 550 Spyder. The 1974 Porsche 911 Carrera RSR Turbo 2.14 (lot 55) at $3,245,000, a world auction record for a Porsche 911. The 1976 Porsche 935/76 (lot 47) at $2,530,000, a world auction record for a Porsche 935. The 1984 Porsche 962 (lot 53) at $1,925,000, a world auction record for a Porsche 962. The 1997 Porsche 911 GT1 Evolution (lot 49) at $1,265,000, a world auction record for a Porsche 911 GT1. The 1967 Porsche 906E (lot 69) at $1,001,000, a world auction record for a Porsche 906. The 1976 Porsche 934 (lot 51) at $891,000, a world auction record for a Porsche 934. The 1980 Porsche 924 GTP (lot 48) at $385,000, a world auction record for a Porsche 924. The 1992 Porsche 968 Turbo RS (lot 60) at $346,500, a world auction record for a Porsche 968. The 1981 Porsche 944 GTP (lot 58) at $308,000, a world auction record for a Porsche 944. *Prices are in US Dollars, including buyer’s premium. Gooding & Company is not responsible for typographical errors or omissions. A complete list of prices realized is posted on Goodingco.com following every auction. Gooding & Company, internationally celebrated for its world-class automotive auctions, provides unparalleled service in the collector car market, offering a wide range of services including private and estate sales, appraisals and collection management. In the past two years, Gooding & Company has realized the most prestigious automotive records in the world for a Car Sold at Auction with the iconic 1957 Ferrari 250 Testa Rossa Prototype at $16.39 million, an American Car at Auction with the 1931 Whittell Coupe Duesenberg Model J at $10.34 million, and the undisclosed private treaty sale of the world’s Most Valuable Car with the 1936 Bugatti Type 57SC Atlantic. The auction house ignited 2012 when it achieved extraordinary results at its annual Scottsdale Auctions in January with more than $39.8 million in sales and 98% sold. 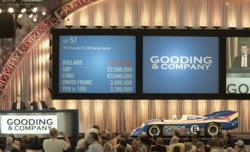 Renowned for its annual standing as the official auction house for the Pebble Beach Concours d’Elegance, Gooding & Company will return to Pebble Beach, California on August 18 & 19, 2012. Beginning a new chapter in its nearly 40-year heritage, the Omni Amelia Island Plantation is undergoing an extensive re-imagination project. As Florida’s award-winning island destination, the resort is recognized for offering a luxury resort experience in perfect harmony with nature, rich in recreational activities. The certified Green Lodging Destination is nestled between the Atlantic Ocean, lush marshlands and the Intracoastal Waterway, located just north of Jacksonville, Fla. The property sits on three-and-a-half miles of wide, uncrowded beaches and includes 49,000 square feet of flexible meeting space; 54 holes of championship golf; 23 Har-Tru® tennis courts; award-winning recreation programs; a shopping village with restaurants, boutiques and gift shops as well as the nature-inspired signature spa; a state-of-the-art fitness center; nine culinary options ranging from casual to fine dining; kids camps; and numerous activities for adventurers including water sports, horseback riding, walking, hiking and Segway tours. With 249 guest rooms in the oceanfront resort, the Villas of Amelia Island Plantation Resort offer 300 one-, two- and three-bedroom villas with ocean, golf or resort views. For more information, please call 1-800-The-Omni or visit omniameliaislandplantation.com.